Other Common Names: Sweet gale, candle berry, Porsch (German), galè odorant (French), arrayán brabántico (Spanish), mjaðarlyng (Icelandic), pors (Danish). Habitat: The plant is endemic to northern and western Europe and can also be found in some parts of northern North America. Description: Bog myrtle is a small flowering shrub that can grow up to 2 meters tall. It is found in bogs, marshes, fens and wet heathland but because of loss of habitat, the plant has become endangered in many places. The leaves are gray-green, spirally arranged and oblanceolate with a tapered base and broader tip, and a finely toothed margin. The flowers are catkins (cylindrical flower cluster, with very small or no petals), with male and female catkins on separate plants. The fruit is a small drupe. The plant thrives in very nitrogen-poor soil due to Actinobacteria found in the roots that can bind nitrogen from the air. Plant Parts Used: It is mainly the leaves that have been used as herbal medicine but sometimes the flowers (catkins) and buds have also been utilized. The leaves are collected in the summer and the catkins, which are high in essential oil, are collected in the spring. The fruits (drupes) are collected when they are ripe and can be boiled to produce a wax for candle productions. Unfortunately, the fruits do not produce enough wax to make it commercially viable. The herb can be used in the form of extracts, decoction or alcohol-based tinctures. The leaves contain an essential oil which is rich in various terpenes. The main substances are alpha-pinene, 1,8 cineol, myrcene, and limonene. Additional substances found in the plant are beta-cadin-4-En-10-ol, 11-selina-4-ol, beta-terpinene, p-cymene, caryophyllene, 4.11-selinadien, beta-elemennon, germacrone and a trace amount of other substances. The plant also contains toxic flavon-glycosides and large amounts of bitter tannins. In Northern Europe, the bog myrtle was well-known both for its culinary and medicinal purposes for centuries. Today its uses as a medicinal herb have been mostly forgotten. 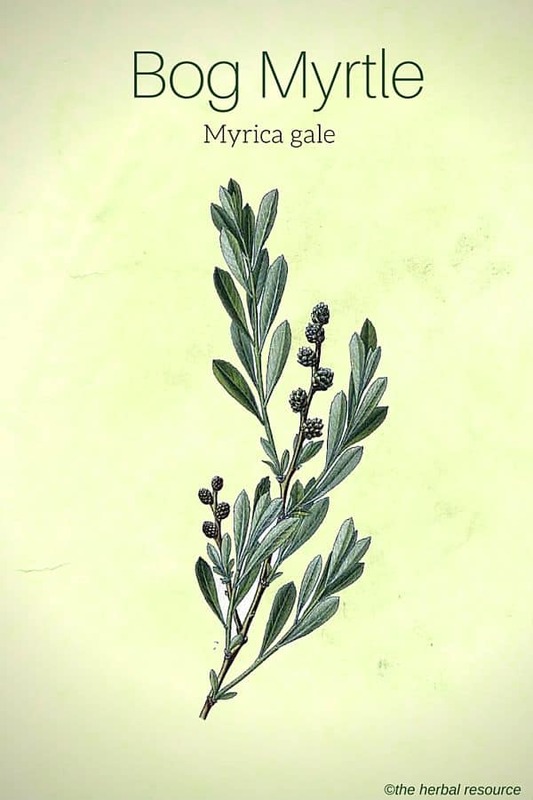 Bayberry (Myrica cerifera), native to North America and closely related to bog myrtle, is better known and is used more in modern herbal medicine. 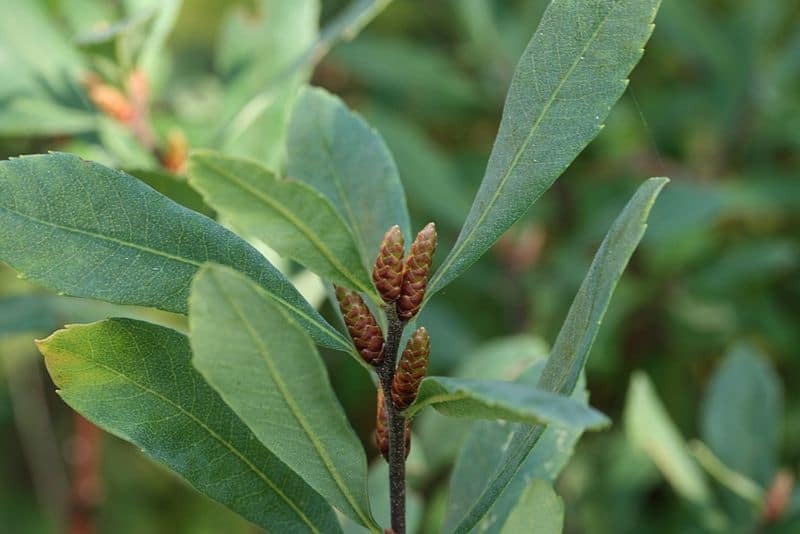 The plant was once used as an ingredient to add flavor to beer (known as gruit) but has been replaced by hops, mainly because the bog myrtle had a reputation for causing severe headaches. Among the Vikings, in Scandinavia, this beer was known as “porsøl”. Some believe that this brew was the reason for the Berserkers. The leaves and fruits are still used for flavoring some brands of schnapps and liqueurs. Bog myrtle is strongly aromatic and in the past, it was used to repel fleas and other vermin. In Scotland, it is well known as a way to ward off the Highland midge. The herb’s insect repelling properties have since then been scientifically proven to be accurate. The plant has been used, and still is, as a mosquito repellent. The essential oil is now recognized as an effective agent against insects (especially mosquitoes). In a Scottish study, volunteers allowed mosquitos free access to their arms. Only one arm was covered with a gel with bog myrtle essential oil. After 10 minutes the protected arm had average of 1.6 stings, while the unprotected arm had 9.4 average stings. Bog myrtle is astringent and antiseptic herb with styptic, wound-healing and diuretic properties. Traditionally it was used as a medicinal herb to treat wounds, acne and digestion problems. In Sweden, the dried bark was used to treat intestinal worms and to relieve itching. In the past, the plant was used to dye wool yellow. It has a spicy scent, reminiscent of camphor, and a bitter strong flavor. The fresh or dried leaves can be used to make tea. Both leaves and fruits can be, in small amounts, used to add flavor to soups, stews and some meat dishes. The plant is one of the traditional components for Scottish wedding bouquets and is used as an ingredient in many perfume products and also as a condiment. 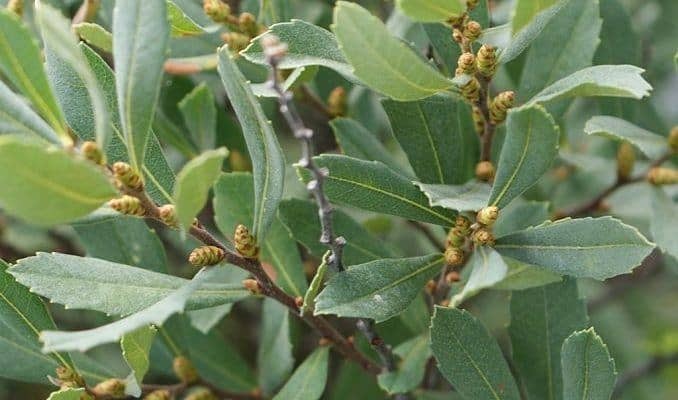 In food and beverages, bog myrtle should only be used in small amount as it can cause headaches and other discomforts. If the plant is intended as an herbal medicine a trained herbalist should be consulted prior to use. Bog myrtle can be combined with citronella and/or eucalyptus to enhance the insect repellent properties. Bog myrtle is considered abortifacient and should therefore not be ingested by pregnant women. The highly fragrant essential oil extracted from the seeds is toxic and should never be used internally. In some people, the herb may cause skin irritation. Bown. D.: Encyclopaedia of Herbs and their Uses. Dorling Kindersley. 1995. Huxley. A.: The New RHS Dictionary of Gardening. Grove’s & Macmillan. 1992. Polunin. O. Flowers of Europe – A Field Guide. Oxford U.P. 1969. Does Bog Myrtle come as a cream to avoid mosquito bites or is it only available as an essential oil ? It is easily available as a cream e.g at HighlandSoaps.com. Can bog myrtle be dried, and then added to olive oil for a few weeks. And used as an insect repellant, either in a salve or just as an oil. Well, you can but as most of the essential oil responsible for the insect repellent properties of the herb will disappear when the leaves are dried, you might want to use the fresh leaves.